Use stickers to re-create a scene from a favorite movie! LM's favorite movie is Cars. He loves Lightning McQueen! 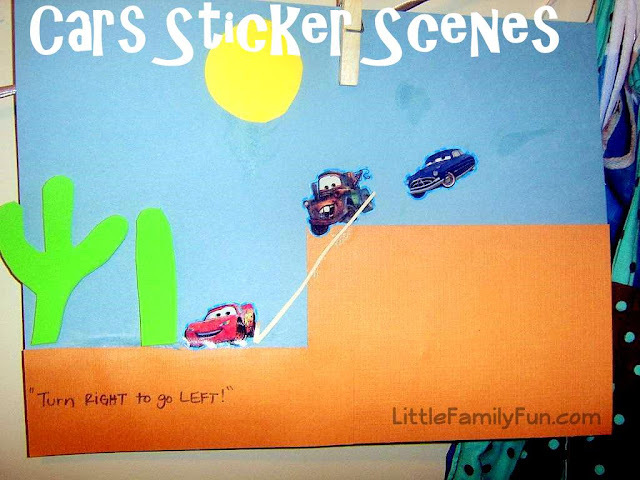 We have some Cars stickers so I thought it would be fun to create one of the scenes from the movie with them, when McQueen races Doc but runs into a cactus and Mater has to tow him back up. You could do this with any stickers from a movie or not. Create a fun scene with whatever stickers you have!